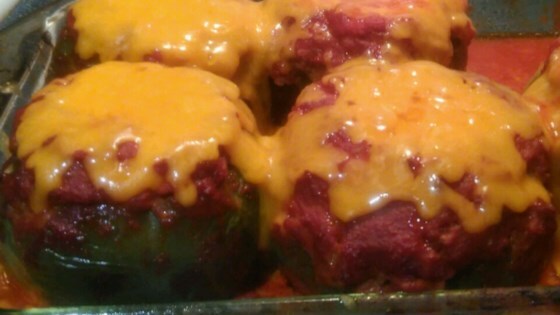 "Stuffed red bell peppers are filled with savory beef and rice and baked with prepared spaghetti sauce for a hearty dish that doesn't need a lot of preparation." Bring a large saucepan of water to a boil, reduce heat to medium, and cook red bell peppers in the boiling water until slightly softened, about 5 minutes. Drain and rinse peppers with cold water. Stir eggs, 3 cups of spaghetti sauce, instant rice, onion, salt, Worcestershire sauce, and black pepper together in a bowl. Crumble ground beef into the mixture and stir until ground beef is thoroughly combined with sauce and rice mixture. Stand peppers in a large baking dish and fill each pepper with beef mixture. Pour 2 cups spaghetti sauce over the peppers. Cover dish with aluminum foil. Bake in the preheated oven until peppers are tender, the filling is set, and an instant-read meat thermometer inserted into the middle of a pepper reads at least 160 degrees F (70 degrees C), 55 to 60 minutes. Uncover and top each pepper with 1 tablespoon Cheddar cheese. These were delicious. I sliced mine in half instead of stuffing the whole pepper, which is what I usually do. I did this just for looks but they were wonderful. One little side note though. I made it just like it was written, they're ok. Very tasty, next time I might add some cayenne pepper to give it a little kick. Turned out great even though I precooked the beef before I added it to the filling mixture, I also didn't boil the peppers and I omitted pouring the extra sauce on the top.